1. Who should not use RegenScalp™ ? RegenScalp™ should not be used by people less than 18 years of age. People with nutritional deficiencies or medical conditions that require the use of medications that cause hair loss may not benefit from the use of RegenScalp™ . Persons with damaged hair from hair care products or harsh grooming practices may not benefit from the use of RegenScalp™ . 2. Will RegenScalp™ work for me? 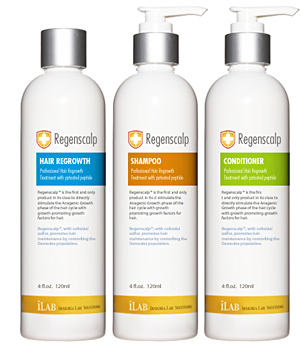 Each person using RegenScalp™ will experience a different amount of hair regrowth and decreased hair loss. To ensure that the product has the opportunity to work, make sure that RegenScalp™ is massaged into the scalp with each application. People with little hair loss and those who are beginning to experience hair loss will likely have a better response than people with long-standing hair loss. 3. How soon can I expect results from using RegenScalp™ ? Results are twofold: hair regrowth and hair retention. Some people may notice a substantial decrease in hair loss with minimal hair regrowth, and vise versa. Others may notice substantial hair regrowth and decreased hair loss. There is no way to predict who will experience which effect. It is important to remember that hair grows only 1/2 to 1 inch per month, so noticeable hair regrowth will occur slowly. When using the product as directed, most people will first notice a decrease in hair loss and some visible hair regrowth within three months. For other people, visible changes in hair regrowth may take up to six months. 4. Can I use RegenScalp™ to prevent hair loss? Yes. Studies have revealed a noticeable decrease in hair loss with continuous use. Since the loss of between 50 to 100 hairs per day is normal, and more is typical of thinning hair, RegenScalp™ should reduce hair loss numbers to within 50 to 100 hairs per day with continuous use as directed. It is unlikely that RegenScalp™ will stop all hair loss. 5. If RegenScalp™ is stimulating hair regrowth, what will the new hair look like? New hair growth will first be soft, thin and downy-like. With continued use, this new hair should resemble the rest of the hair on your scalp. Existing hair on the scalp that has been thinning will gradually become thicker. 6. What will I first notice when I start to use RegenScalp™ ? You will first notice a decrease in hair loss as the product re-regulates the hair cycle. You may wish to monitor this progress by trapping hair as it sheds in the shower and counting the shed hair on a daily basis. 7. How long do I have to use RegenScalp™ ? If you notice hair regrowth or decreased hair loss, you will have to use RegenScalp™ continuously in order to maintain your new hair growth. 8. What happens if I completely stop using RegenScalp™ ? Will I keep the new hair? You will need to use RegenScalp™ continuously in order to keep your new hair growth and optimize hair retention. If you stop using RegenScalp™ , new hair will begin to fall out in 3 to 4 months as the hair cycle is completed. 9. When do I use RegenScalp™ ? Apply two to four hours before going to bed. This will allow RegenScalp™ to dry on the scalp. 10. How long will one bottle of RegenScalp™ last? The product is supplied in a 4 ounce bottle. Each bottle should last 30-45 days when used as directed. 11. What if I forget to use RegenScalp™? If you miss an application, simply resume your regular nightly application. 12. Can I use RegenScalp™ more than once daily? Will it work faster, better? There is no benefit to using the product more than once daily. It will not work faster or better. 13. Can I apply RegenScalp™ and wash my hair an hour later? No. For best results, you should allow four hours for the product to dry on the scalp. 14. What kind of shampoo should I use with RegenScalp™ ? You may use any kind of shampoo. 15. Can I use hair sprays, mousses, conditioners, gels, etc? 16. Can I have my hair colored or permed or use hair relaxers while using RegenScalp™ ? You may color or perm your hair. However, you should be aware that RegenScalp™ will not prevent hair loss caused by hair or scalp damage that may occur with these processes. You should not use hair relaxers. The residual chemicals left behind from the relaxing process will denature the product’s active ingredients. 17. Can RegenScalp™ produce unwanted hair growth? Unwanted hair growth on the face and body has not been reported. If you notice unwanted hair growth, you may decrease the amount of the product that you apply to the scalp or the frequency of product application. You should also take care to wash your hands after application. 18. Can I use RegenScalp™ for baldness or hair loss in babies or children? No. The causes of baldness and hair loss in babies and children are different from the causes of hair loss in adult men and women. 19. Can I use RegenScalp™ in combination with other hair rejuvenation products? Yes. You may use RegenScalp™ in combination with Propecia. 20. What are the most common side effects? Some people experience itching of the scalp. 21. Is there a patent on the formulation in RegenScalp™? Information on this document is provided for informational purposes only. It is not meant to substitute for medical advice provided by your physician or other medical professional. You should not use the information contained herein for diagnosing or treating a health problem or disease, or prescribing any medication. You should read carefully all product packaging and labels. If you have or suspect that you have a medical problem, promptly contact your physician or health care provider. Information and statements regarding dietary supplements have not been evaluated by the Food and Drug Administration and are not intended to diagnose, treat, cure, or prevent any disease. Copyright © 2008 Insignia Lab Solutions., All rights reserved.